When I told my friends I was planning to drive from NY to Boston and needed to find a place to have lunch on the way they thought I was crazy. Not because I was in NY or because I was going to be driving but rather because I was planning a lunch "pit stop". I was told by more than one person not to worry "there will be plenty of places to stop for food on the road" Well they were right; there were plenty of places to stop. All fast food. I know you're probably thinking: what did I expect to find on the road. Well with a little effort and planning (really that's all it took) I actually found a great Italian deli. Literally feet from the Stratford exit off I-95 is Gaetano's Deli. 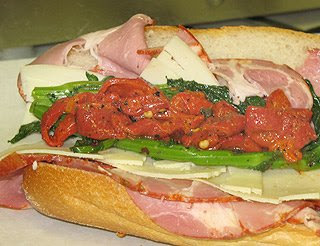 Gaetano's is a small store front packed to the gills with Italian specialties. 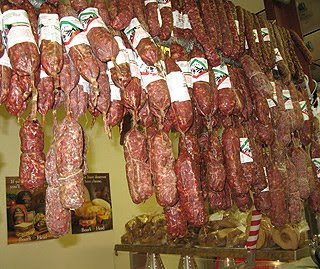 There are shelves filled with dried pastas, glass cases containing various antipasti selections and cured meats hanging from above. It's only downfall is that it doesn't have seating. The guys behind the counter are all from Brooklyn and seemed to know just about every customer by name. Those they didn't know were still made to feel at home with freshly cut slices of sharp provolone to sample while deciding what to order. A very nice touch. The menu consists of about 20 or so cold sandwiches, 8 hot dishes, various salads, stuffed breads and most importantly cannoli. I was in heaven. We ordered the "godfather" a side of tortellini salad and a cannoli. Yes, we had to eat it in the car but I'd rather eat good food in the car than fast food on the road any day. So if you find yourself driving between NY and Boston I would highly recommend a "pit stop" in Stratford for some good food. And make sure you tell the boys I sent you!